Important! Before you perform any of the troubleshooting below, make sure that you have the latest version of Sure Cuts a Lot for eclips (eCAL) installed on your computer. You can check your version number by clicking on the Help option in your toolbar and then selecting About eCAL. Laser Calibration Setup... doesn't drop the blade to create the calibration point. My mat is slightly bowed and I think it may be causing some issues during loading or cutting. What can I do? Because the mats that ship with the eclips are not shipped flat, you may have to uncurl your mat by curling it in the opposite direction for a few minutes. Curl it the opposite direction and use a rubber band to keep in place. This will "reset" the mat so that it is flat. I have accuracy issues with Print-2-Cut. What can I do? When experiencing issues with Print-2-Cut, first perform the laser calibration process. 2. Follow the on-screen laser calibration instructions. 3. 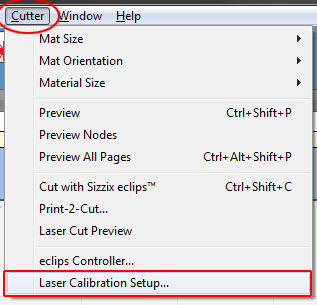 Once you complete the laser calibration process, try Print-2-Cut again. If your results are satisfactory, you are done. If the results are unsatisfactory, try adding a third registration mark. If you are already using three registration marks, try the alternate three-registration option as shown in step 4. 4. (PC) Click Edit and select the Preferences option and then click on the eclips tab. (Mac) Click eCAL from the main menu and select the Preferences option and then click on the eclips tab. 5. From the Print-2-Cut Registration Marks drop-down menu, select 3 (TL,BL,BR) and try Print-2-Cut again. If 3 (TL,BL,BR) is already selected, select 3 (TL,TR,BR) and try Print-2-Cut again. I get random lines when cutting. What causes this and how do I correct it? The blade may be sticking into the cutting mat while the blade holder lifts and moves. Check to make sure the blade is set to the correct cutting height for your material. Also, remove the blade from the holder and see if there is any debris in the holder or on the blade. The blade should be a nice, shiny metallic color.